When our jam band friends Dangermuffin agreed to participate on MyJoogTV, they stated they wanted to tour a winery. So we selected Sugarloaf Mountain Vineyard. The winery is the closest winery to Washington D.C. and specializes in Bordeaux varieties as well as Chardonnay and Pinot Gris. They have also been able to leverage many years of east coast wine experience, particularly from viticulture consultant Lucie Morton, to produce several excellent wines. During the filming we tasted their 2010 Chardonnay and 2009 EVOE! - a blend of Merlot, Malbec, Petit Verdot, and Cabernet Franc. The Chardonnay is crafted in the Chablis style - no secondary malolactic fermentation - and aged in French Oak. 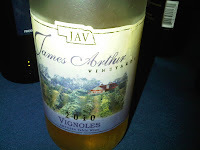 This wine exudes chardonnay - plenty of fruit - no oak residue, and a long tail. The EVOE! is aged 19 months in French Oak and the Merlot dominants for a very drinkable wine with very soft tannins. 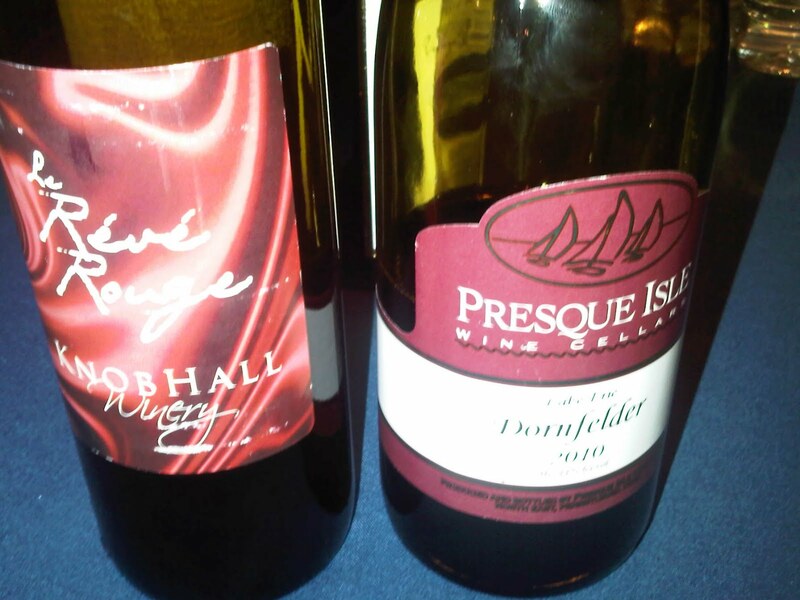 Both wines display why Maryland Wine should not be avoided, but instead, actively sought. Maryland Wine is receiving a youthful boost with the entry of Old Westminster Winery into the industry. The winery is owned and operated by the Baker Family, with siblings Drew, Lisa, and Ashli managing the vineyard, wine making, and marketing respectively. And evidently the housing crash of 2008 lead to the creation of the winery. Wanting to sell the winery, and seeing reduced property values, the family investigated alternative uses for the land and decided, why not a vineyard and winery. They then planted seven acres of grapes, some unique to Maryland: Cabernet Franc, Syrah, Merlot, Chardonnay, Albariño, and Sauvignon Blanc. The first harvest from these vines occurred during the Autumn of 2011, so they will need to wait two more years until they can utilize estate fruit. In the meantime, they are sourcing fruit from other Maryland vineyards, Chatham Vineyards in the eastern shore of Virginia, and from California. As their name suggests, the winery is located just outside of Westminster, Maryland and expects wine sales to be driven through their tasting room. They are located only twenty miles from the Baltimore Beltway. They also plan to follow the wine style modeled by neighboring Black Ankle Vineyards and eschew the sweet wine market and concentrate on premium dry wines. Currently the winery is not open to the public (expect a Spring 2013 opening) but are allowing 100 Century Club members to receive lifetime access to the facility in order to taste the wines as they progress from barrel to bottle. Lisa Baker invited me to visit the winery and sample the wines from barrel. While planning the trip I realized their story may be interesting to viewers of VirginiaWineTV, so we also filmed an episode which will b e available in early April. How interesting? Well, how often to 20-something year old siblings start a winery. Drew, the elder, is 26 and could not join us since he is on sabbatical in New Zealand, learning from the southern harvest. Ashli, the youngest, will graduation college this year take over all marketing functionality. And Lisa, 23, is the full time wine maker. Her Chemistry degree is an obvious advantage in her new vocation and there are plenty of consultants available to instruct through each phase of wine making. However, my initial skepticism was how has she developed a palette for noticing the nuances in different wines. She acknowledges this potential handicap and described to me how she and Drew have tasted hundreds of wines trying to identify missing structure or imperfections. They will continue this crash course in order to improve both their palettes. And Lisa is getting plenty of practice in the winery. Last year the Maryland Assembly passed a law legalizing the equivalent of a custom crush. So this year, Old Westminster Winery became such a facility and Lisa assisted consultant John Levenberg in making wine for two other Maryland start-ups, Crow Vineyard and Winery and Vineyards At Dodon. I arrived at the winery to find their first bottled wine, the 2011 Maryland Rosé, produced from the bleeding of their Maryland sourced Merlot. The also bottled a Rosé from the Chatham grapes, keeping that juice separate so they could enter the Maryland Rosé into state competitions. Since their red wines will remain in barrel for another 12-14 months, the saignée rosés provide the Bakers with quick proof that there infant enterprise is truly a functioning winery. Before we sampled the wines, Lisa described how each stage in the wine making process is dictated by their core philosophy: producing high quality wines. These include hand sorting the grapes, separate heating and cooling systems built into the fermentation tanks, and close oversight with the winery's consultants (initially John Levenberg, now Carl DiManno). We started our tasting with the Merlot from Chatham and it was quickly evident that another to creating quality wine was obtaining quality fruit. And this lot contained solid fruit. After only two months in new French oak, the wine retaining a fruit forward character and a little harsh tannins from the stems and skin. Over time these tannins will mellow and change as tannins from the wood are im parted into the wine. Yet this wine is really drinkable now - a solid wine that hopefully will retain its fruit during the next 14 months in barrel. 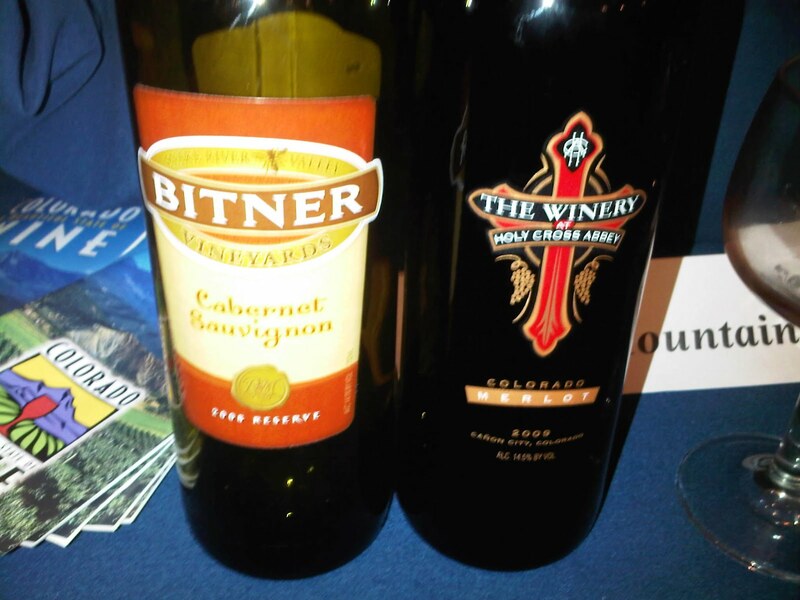 The next two wines were sourced from California and will be used to supplement the Maryland and Virginia lots. The fruit from both barrels, one Merlot, the other Syrah, were lighter than the Chatham Merlot and will need more time in barrel to generate more body and structure. The wines will also benefit from barrel aging to introduce more tannins. Ironically, these batches will test Lisa's wine making skills. The final wine was a Maryland Cabernet Franc, where they grapes were sourced from a vineyard in Thurmont Maryland. In general, this wine is coming along nicely. It had as much fruit flavor as the Chatham Merlot, but with less tannins. Evidently the tannins are mellowing quickly because Lisa noticed a change since the last taste a week ago. And paired with a proprietary chocolate, the tannins disappeared completely. Maybe that's how they will market dry wines to a sweet wine market. I look forward to returning to Old Westminster in six or seven months when they start crushing and fermenting their white wine. And hopefully at that time Drew will be available to navigate us through their second year of harvest. 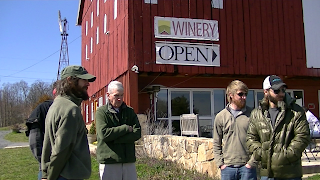 Check out their Century Club video below and I'll be adding the link to the Virginia Wine TV episode soon. Cheers. Most of you are probably already aware of the phylloxera epidemic that ransacked Europe vineyards starting in 1867. One Bordeaux grape, Carmenère was particularly susceptible to the louse. The epidemic was finally alleviated when viniferia vines were grafted to phylloxera-resistant American rootstocks. Once again Carmenère suffered because the vine didn't take to the new grafts and growers felt the grape was too difficult even when conditions were favorable. Thus Carmenère was eventually replaced with more familiar vines, such as Merlot and Cabernet Sauvignon, and was soon thought to be extinct. Once a major player in Médoc and Graves and then gone....at least until 1994. That is when Professor Jean-Michel Boursiquot from the Montpellier's school of Oenology conducted DNA analyze and determined that a Chilean Merlot clone was actually Carmenère. How was that possible? Before the phylloxera epidemic, Chilean vignerons had been importing the vines from France thinking they were receiving Merlot grapes or a clone of Merlot. Apparently, their leaves are very similar. They had no clue it was a distinct grape variety. And in fact, it was a general practice to combine the Merlot grapes and this "clone" which lead Chilean Merlot to differ from Merlot wines produced elsewhere. Then came Professor Boursiquot's DNA analysis and a few years later Carmenère was categorized as a distinct Chilean grape variety. And today, Carmenère is Chile’s signature grape. Carmenère is dark-skinned grape variety and requires a long growing season to reach its prime potential. These conditions can be found in the Colchagua Valley in Chile, the southernmost portion of the Rapel Valley - and located about 80 miles southwest of Santiago. The Colchagua Valley was named 2005 Wine Region of the Year by Wine Enthusiast and the warm Mediterranean climate has been compared to Napa Valley. Humidity is low, frost is unknown, and breezes from the Pacific cool the valley at night creating a potential 40°F diurnal temperature variation. A perfect vine growing environment; particularly for Cabernet Sauvignon (11,186 hectares; but Carmenère is well represented at 2,344 hectares. It has a unique sensory profile that runs to red raspberry, dried herb and white pepper in good years. Adds to complexity in blends too. We use it in blends more often than as a 100% varietal, but I will have released three vintages varietally. French Oak 30-40% new. 18 months or so in cellar. 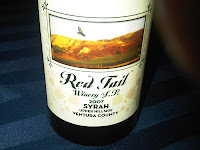 Nice, medium bodied red that is more dynamic than Merlot but not as heavy as Cabernet. This is still a niche varietal that arouses interest and curiosity. It does require education of the customer, but we are not thinking of getting into Carmenère in a big way…just something fun to show people that is new and rare. Want to know what to expect with a Carmenère wine? Our friend, Todd Trzaskos from Vermont Wine Media, is a student of Chilean wines and explains, "Carmenère has the fruit of Merlot but plummier, tannins of Cabernet Sauvignon, but softer. I'll drink to that. 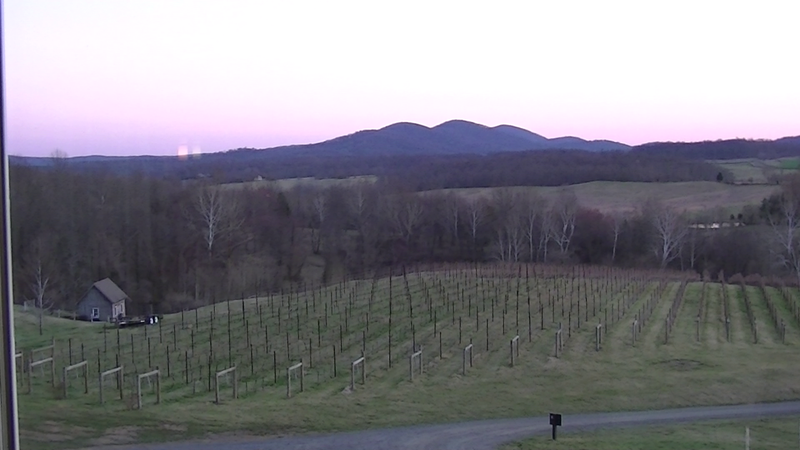 One of the most recognized vineyards in the Commonwealth of Virginia is Honah Lee Vineyard. The property is owned by Wayne and Vera Preddy and sits at 1000 feet elevation on a steep South-West facing slope in central Virginia (Orange). This means that the grapes are exposed to an abundance of sunlight during the hot summer months; but the elevation provides suitable diurnal temperature variation through night-time cooling. The soil is hard clay which limit deep root growth and leads to more fruit character over minerality. The vineyard was first planted by Jim and Sharon Horton from Horton Vineyards when they leased the property from the Preddy's. The vineyard provided the foundation for Horton to quickly become one of the premier wineries in the state and showcased their Rhone and Portuguese varieties. However Horton was eventually evicted from the property after a dispute with the landlords. Horton's loss quickly became other winery's gain as the vineyard's sourced the fruit to several Virginia wineries. And many of these wineries choose to create single vineyard wines from the grapes. 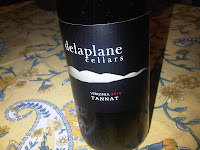 Delaplane Cellars, for example, has or continues to produce a Honah Lee single varietal Viognier, Syrah, and Tannat. 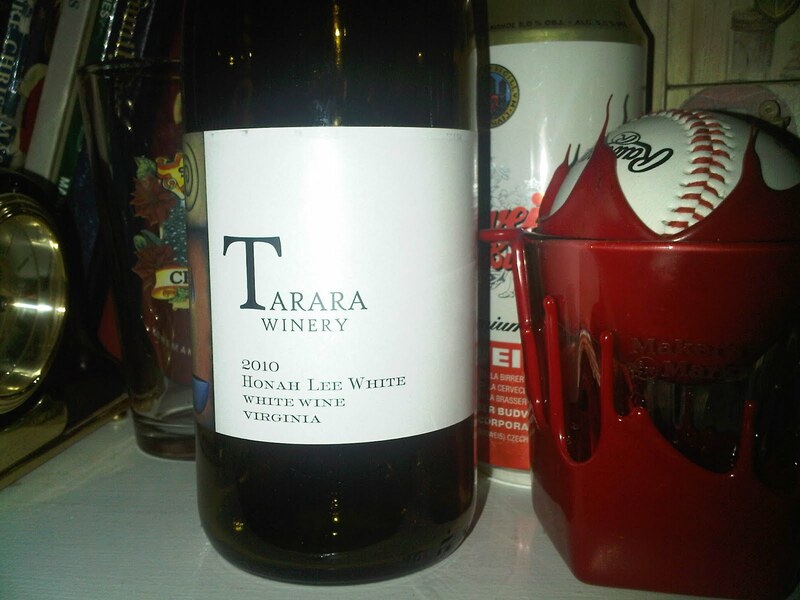 Our feature winery today, Tarara Winery, has created an interesting take on the single vineyard theme by creating a single vineyard blend: the 2010 Honah Lee White. The blend consists of Virginia's signature grape Viognier (40%), Petit Manseng (40%), and Roussanne (20%). This is a dry wine with peach and apricot flavors - thanks to the Viognier - and plenty of balanced acidity thanks to the petit manseng. Winemaker Jordan Harris writes that "Honah Lee Vineyard is one of our favorite partners....the fruit from Honah Lee is some of the most enticing and exotic fruit we get each year." And one of Jordan's goals is to recognize and highlight the best vineyard sites in Virginia as evident by the Tranquility, Nevaeh, and Honah Lee labels. This year the 2010 Honah Lee White was the only Viognier based wine to receive a Gold medal in the newly revamped 2012 Governor's Cup competition. Revamped in the sense that, among other changes, now all wines submitted into the Governor's Cup must consist of 100% Virginia grown fruit - reversing the previous policy of allowing 25% outside fruit. We concurred with the award and after sampling a few at the Governor's Cup reception, "borrowed" a bottle to use in our toast during our interview with Governor McDonnell below. Cheers. 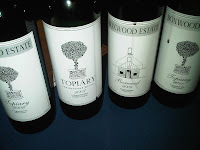 Last Saturday night (March 10th) we were invited, along with several other wine bloggers, to Delaplane Cellars where owners Jim and Betsy Dolphin were showcasing their soon to be released red wines. The winery focuses on single vineyard wines, whether single varietal or blends. And the winery excels in showcasing these vineyards on the wine's labels - a practice we wish more wineries would follow. But before heading downstairs into the barrel room, we were first offered a palate cleansing white, the 2010 Mélange Blanc, a blend of Chardonnay (62%), Honah lee Viognier (27%) and Petit Manseng (11%). 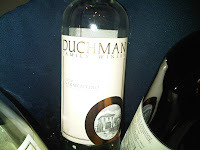 Even with the petit manseng, this is a dry blend - fruity with refreshing acidity. For those of us who usually enjoy the winery's 100% Honah Lee Viognier, this wine will have to substitute, since they did not receive enough fruit to produce a single varietal. 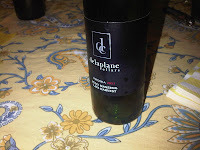 Once downstairs we started with the first estate wine bottled at the winery, the 2011 Delaplane. The vines were planted in 2008, and thus, three years later bearing suitable fruit. The blen d is predominately Merlot (50%), followed by Cabernet Sauvignon (33%) and Cabernet Franc (16%). The wine is fruity with low tannins making this an easy drinking wine. The only deficiency was a lack of mid-palette - but that will probably go unnoticed by most consumers. The next stop was at a Slavokian oak barrel filled with their Williams Gap 2010 using grapes sourced from Williams Gap Vineyard - located in Loudoun County near Round Hill, Virginia. The wine is a blend of Cabernet Sauvignon (31%), Merlot (30%), Cabernet Franc (27%), and Petite Verdot (12%). This is a bigger wine than the Delaplane- with bold flavors and more tannins on the tail, even though the wine went through extended masceration to soften the tannin structure. This will be a fine wine, possibly my favorite blend of the evening. The final blend was the 2010 Springlot, sourced from grapes grown on the top of Naked Mountain by John Everson. The proportion of grapes was directly related to amount of grapes sourced which corresponded to a semi-Right Bank wine: Cabernet Franc (40%), Cabernet Sauvignon (30%), Merlot (17%), and PV (14%). We then moved to two single varietal red wines starting with the 2010 Shirland Syrah aging in a new American Oak barrel. For those who are interested, the vineyard is located near M iddleburg. The wine will be located in the people's cellars rather quickly since Delaplane has a history of crafting mighty fine Syrah. I don't see this as an exception. The other single varietal red was the 2010 Honah Lee Tannat and as many are aware, this Orange, VA vineyard is the source of many different grape varieties. Whereas their 2009 Tannat needed to lay down because of the high tannins - the 2010 version is ready to drink now. The juice was pressed quickly at dryness so as not to add even more tannins. Tannat is quickly becoming a favorite wine of ours and this is another example of an underrated grape that excels in the Commonwealth. Finally, we samp led what we consider Virginia's other signature white grape, Petit Manseng. 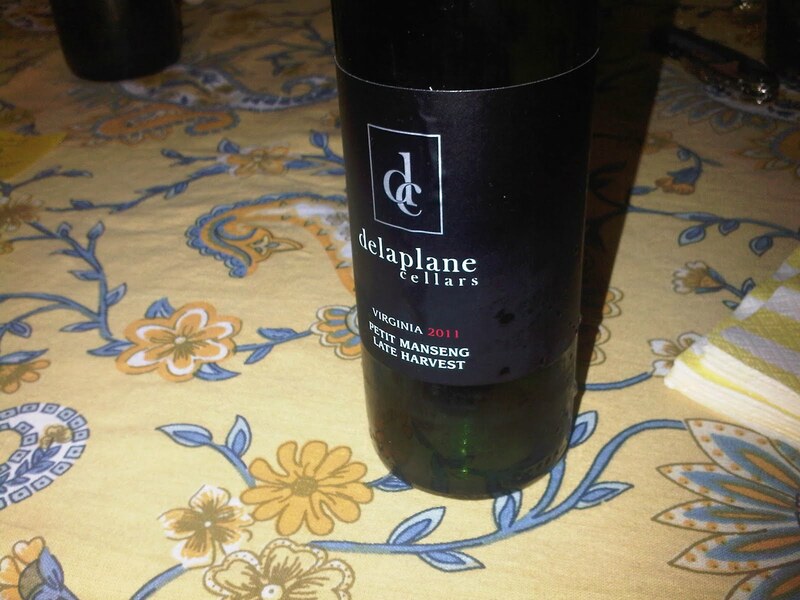 For the first time Delaplane is producing an estate Late Harvest Petit Manseng which comes in at 10.5% RS but with typical acidity to balance the sugar. This pineapple flavored wine will satisfy their consumer's demands for a sweet offering. 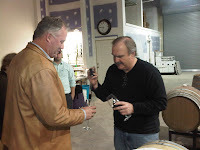 This was a special evening where I was fortunate enough to be invited to the barrel sampling, but also a chance to meet or catch up with fellow bloggers My Vine Spot, Wine About Virginia, Virginia Wine In My Pocket, and Craig's Grape Adventure. 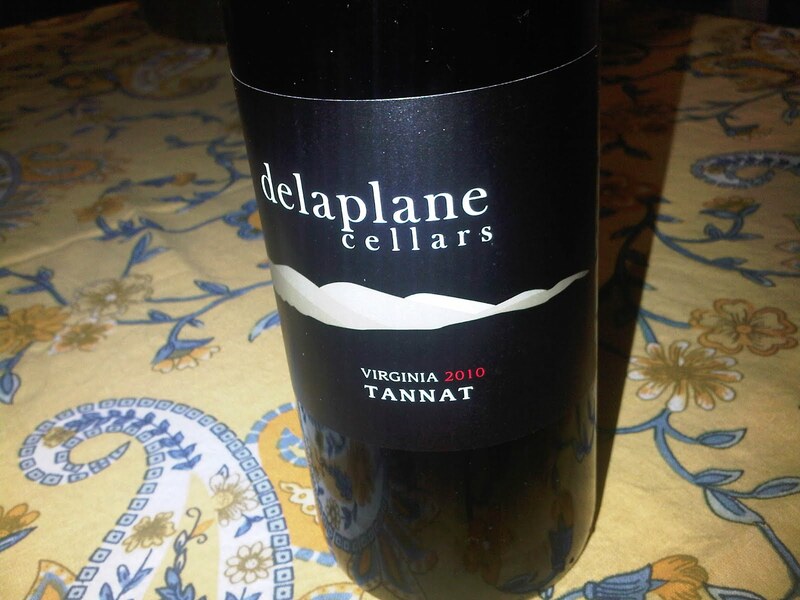 Cheers to Delaplane Cellars. Last night we were invited to the joint WineAmerica & Winegrape Growers of America reception on Capital Hill called "Taste the Wines of America". The event was to recognize the Congressional Wine Caucus, which is bipartisan group of lawmakers aiming to "educate and engage colleagues in legislative and regulatory matters pertaining to the wine community." The reception also coincides with meetings within the wine industry on matters affecting the entire community. But the highlight for most was the reception which featured wines from every region of the country. Most impressive was the large selection of wines from the Other 46. Yes, California, Oregon, Washington, and New York were well represented, but how many times do you get to sample wines from Massachusetts, Iowa, Nebraska, Georgia, Indiana, Arizona....... You get the picture. We walked in to immediately see the three B's of Virginia representing the Southeast: B arboursville Vineyards, Boxwood Winery, and Breaux Vineyards. Plenty of Viognier and Bordeaux blends available at that table, as well, as wines from Tennessee, Georgia and North Caroline, with Biltmore Estate Winery representing the Tar Heels. We learned that their estate NC wines are made from grapes grown in Polk County, south of Asheville. We moved next to this year's DrinkLocalWine.com hosts, Colorado Wines, which were part of the Rocky Mountain contingent. Also representing Colorado was Guy Drew from Guy Drew Vineyards in Cortez Colorado who was pouring several of his wines: Viognier, Rose, Riesling, and a very nice Meritage. 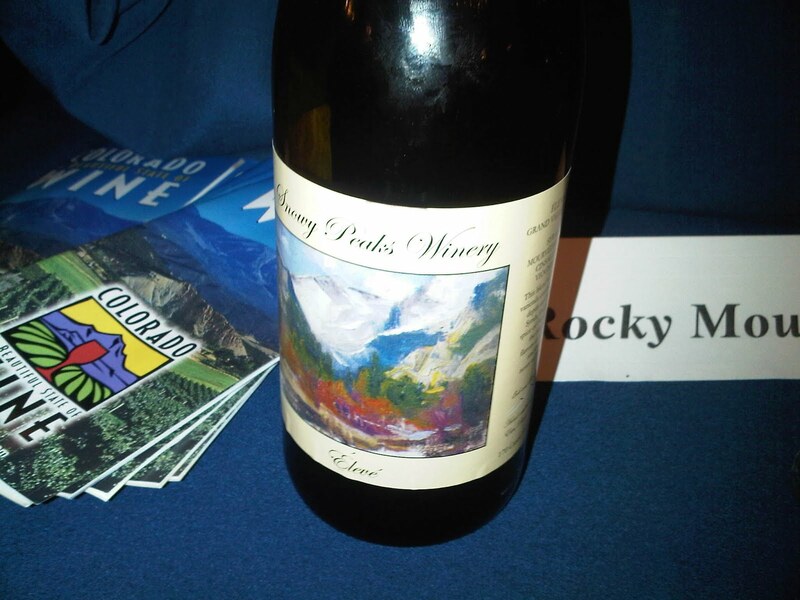 Another Color ado wine we really enjoyed was the Rhone blend made from Snowy Peaks Winery from Estes Park. Their Grand Valley "Eleve" consists of Syrah, Mourvedre, Cinsault, and Viognier. Incredible that these grapes can flourish in the Grand Valley. 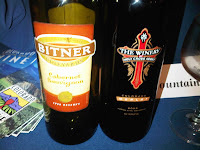 Finally, we met Dr. Ron Bitner, one of the first growers in Idaho and owner of Bitner Vineyards in Caldwell. 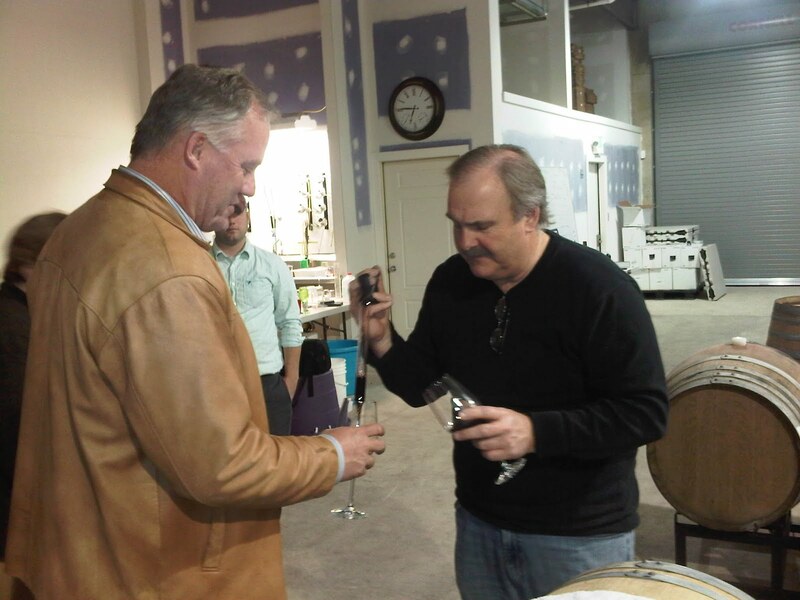 We enjoyed his Snake River Valley Cabernet Sauvignon Reserve whe re the grapes are harvested around Thanksgiving. Yes, that late. Frost is obviously a concern, but the vineyards steep slopes allow the cold air to pass easily down the mountain. And we finally got to sample a wine from the famed Arizona Stronghold Vineyards - this the 2009 "Site Archive" Merlot. Hope to follow up with a visit to Arizona wine country this summer. And check out the DLW12 Conference being held April 28th at the Metro State College in Denver. The Twitter tasting of Colorado wines should be very, very interesting. The next table was the wines from the Northeast, handled by Maryland Wine. We started with the flexible Chambou rcin, sampling the Rose from Port of Leonardtown Winery Leonardtown Maryland and the Knob Hall Winery (Clear Spring MD) Cumberland Valley "Le Reve Rouge". This was an interesting take of a Rhone wine, substituting Chambourcin for Syrah and Vidal for Viognier. 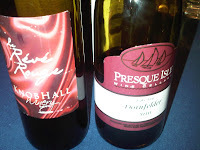 After tasting some wines from Massachusetts, we found our favorite from North East Pennsylvania: Presque Isle Wine Cellars Dornfelder. There's a nice little micro-climate near Lake Erie which allows vinferia grapes such as Dornfelder, Riesling, Pinot Noir, and even Cabernet Sauvignon to survive. The Great Lakes were next, featuring wines from Indiana, Michigan, Ohio, and Wisconsin. We were reminded why Traminette is the state grape of Indiana through Wildcat Creek Winery. Wisconsin was represented by Wollersheim Winery and there were several Michigan wines; yet we couldn't find the L. Mawby Vineyards Cremant Classic sparkling wine. Painful. Someone was monopolizing the goods. But not the ice wine. The Breitenbach Wine Cellar Vidal Blanc Ice Wine is a true ice wine, where the frozen grapes are harvested during the middle of the night to maintain the condensed sugars. Nice. And then there the wines of the Midwest containing bottles and bottles of unique grapes: Blanc du Bois, Vermentino, Tempranillo, Marquette, Brianna, St. Croix, Norton, Edelweiss, and Vignoles. The table was represented by Missouri Wines, James Arthur Vineyards from Raymond Nebraska, and Fredericksburg Winery from Fredericksburg, Texas. 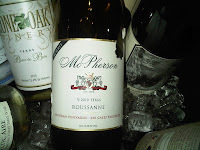 The later was pouring a savory Muscat Canelli and started a trend of nice whites including the McPherson Cellars Rousanne and the Duchman Family Winery Vermentino. These are two clean, food friendly wines. We've mentione d the Stone Hill Winery Norton many times over the years and this night reinforced why that grape should not be overlooked. And then there were the hybrids - many manufactured from the University of Minnesota specifically for cold weather climates. There were the Tassel Ridge Winery Brianna, Marquette, and St. Croix and the James Arthur Vineyards Edelweiss, a sweet wine with a balanced acidity. 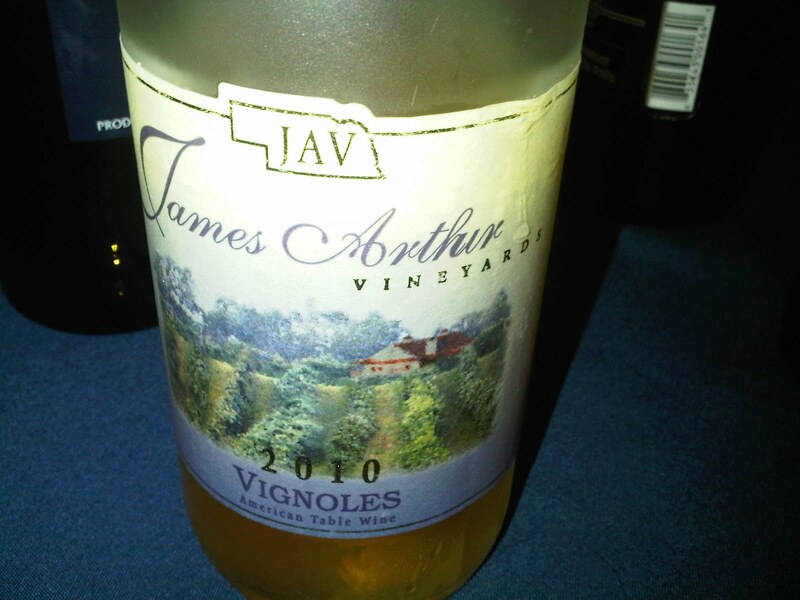 Yet the easy favorite was the JAV Vignoles - an off dry wine with strong apple flavors and nice acidity. This is one wine I always want to have available; suitable for dry and sweet drinkers. Thanks WineAmerica and the Winegrape Growers of America for a nice tasting from across the states. Cheers. We recently learned that one of the founders of the post-Prohibition east coast wine industry was Philip Wagner, founder of Boordy Vineyards. Wagner and his wife Jocelyn began planting grape vines in the early 1930's specializing in French Hybrids and propagated these to vineyards throughout the East and Midwest. "Vidal Blanc, for example, was first found by the Wagners in a backyard vineyard in Poitier, France, a town southwest of Paris about half way to Bordeaux, and cuttings were 'smuggled' into the U.S. wrapped in a damp towel in Jocelyn’s purse." Other grapes the Wagners championed were Chambourcin and Baco Noir. Apparently these grapes were not enough. Rumor has it that Wagner contacted Dr. Harold Olmos, of UC-Davis, to develop a tannic, "hearty grape that could translate into a marketable wine for colder climates". After 20 years of cross breeding, Olmos finally publicized this cold climate grape: Carmine - a cross of Cabernet Sauvignon, Carignane, and Merlot. What? A cross of three grapes. How is that possible? Well, with a lot of time and patience. First, Olmos crossed Cabernet Sauvignon and Carignane. The progeny was then crossed with Merlot - so in reality Cabernet Sauvignon and Carignane are the grandparents. The result is a late budding and ripening grape, slightly larger than Cabernet Sauvignon, with loose clusters. Perfect for most American wine growing regions. Yet, despite Olmos' efforts, Carmine never really gained traction. Today, the grape is grown in only a handful of vineyards in the United States. The largest grower is perhaps Kramer Vineyards, located in Gaston, Oregon. Trudy Kramer related to us why Carmine. "Every wine has a story. We were amateur winemakers and found out about Jim Leyden at Courting Hill Vineyard who had a nice selection of different varieties. So it was one place to go many times throughout the vintage to pick grapes to make our wine. One grape he had was Carmine. He had brought it into the state—not sure if it was legal or not. But he was intrigued with it and was trying to get people to plant it. When he found out that we were planting, he talked Keith into planting it, but I wasn’t sold on it. My take on it was that none of the grapes it was from, Cabernet, Carignane, or Merlot, did well in the Willamette Valley so why would we even think of planting it? So he pleaded with me and I said, “So, if it doesn’t sell, out it goes!” Deer were ravaging it for a few years until Keith finally put a good deer fence up so we make our first in 1998. It wasn’t until 2000 that we figured out how to craft a good wine out of the grape. The issue is ripening and the presence of the green bell pepper notes that I don’t like at all. Carmine was supposed to be for the “cool” central California coast. We are a lot cooler than the Central California Coast! But Jim knew they were growing it successfully in New York and Pennsylvania in cooler regions there. People made regular red wine, rose, and sparkling out of it." And Kramer has experienced how versatile the grape is - from crafting a big red tannic wine to a soft rose. "When have a vintage warm enough to give us riper flavors, then we make a red wine ferment in bins, press out before fermentation is totally done, settle, and put into barrels to finish fermentation. We also inoculate with malolactic. The acids are pretty high so we often have to adjust those in the beginning. Sugars are low so we have to add that every vintage. In 2010, the fruit had a lot of unripe flavors in the skins, just green as it could be. Since it was the latest vintage ever, we decided to wait into November and pick it as late as we could. We took a sample of the juice to the lab and we just couldn’t see how it could be made into a red wine. As we were reading the lab report, Kim tweeted about our dilemma on-line. A local wine writer suggested doing a rose. So she runs out and takes a juice sample and tastes it. Just delicious with no green! We were shocked. So two days after harvest, we pressed it out for a rose. The color was unbelievable—so dark it almost looked like a Pinot Noir. Turned out just great! In 2011, it was even later, so we again decided from the start to do a rose again, but this time it was very cold outside and we had to wait until day 5 to press because the color and flavors weren’t right. This wine has not yet been bottled, but it's even better than 2010! So is it appropriate for the climate? Probably not., but with inventive winemaking, cluster thinning, late picking, and attention to detail, we can make a very good wine out of it." Educated consumers is an issue with Carmine, because, let's face it, how many of us wine geeks has heard of it. Not us until a couple weeks back. Here's Kramer again relating their experience. "Yes, we do have to educate people who are new to our winery. We do have a following for it now which is why we have planted more. It is so different from Pinot Noir and people are curious about it. They often confuse it with Carmenere. Dr. Olmos is rolling in his grave! The work on it was done at UC Davis back in the 1950’s and only a few California vineyards have it. It is nice to have something unique for people to taste when they visit us." The origins of Isabella grape, a native Vitis Labrusca, are still unknown. Perhaps it originated in the Carolinas by random pollination of a labrusca grape and an unknown vinifera. Others have claimed that the grape was cultivated by the Cherokee Indians or that it is a cross between an unknown vinifera and muscadine grapes. Regardless of its origin, it was quickly adopted in New York and New England. In 1824, Deacon Elizah Fry successfully planted the first grapes in New York State – Catawba and Isabella. William Prince of Flushing, Long Island also acquired the grape, purchasing vines from Mrs. Isabella Gibbs, the wife of George Gibbs, a Brooklyn merchant; hence the name, Isabella. Originally the grape displayed the standard "grapey/foxy" taste and flavor associated with Labrusca grapes, but modern winemaking techniques have succeeded in removing this characteristic, resulting in a strawberry/boysenberry-like flavored wine. Over time, Isabella began to be replaced by Concord or other hardier and more productive vinifera varieties, but has survived in a few eastern vineyards. Ironically, while production of the grape is virtually non-existent in the United States, it remains very popular in the rest of the world, where it has over 50 aliases. In Hungary and Georgia it is known as Izabella, Seksarda in Croatia, Fragola in Italy and Australia, and Albany Surprise in New Zealand. Large acreages of this grape are grown in Brazil, Russia, and in Columbia where it is that country’s most widely planted variety. 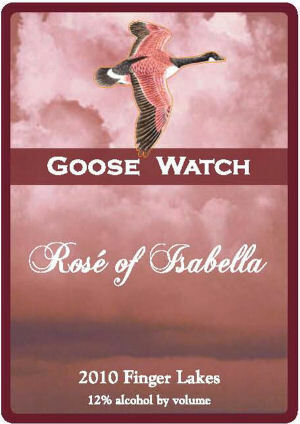 Goose Watch Winery is one New York winery that continues to utilize Isabella. The winery decided to cultivate Isabella because of the grape’s long history in New York and the fact that the variety creates a distinctive Boysenberry-like aroma which separates it from other native varieties that are just “grapey”. As a bonus, the Isabella grape retains strong name recognition in the Finger Lakes region, so visitors to the winery do not need to be cajoled to taste the wine as with other non-mainstream grapes. 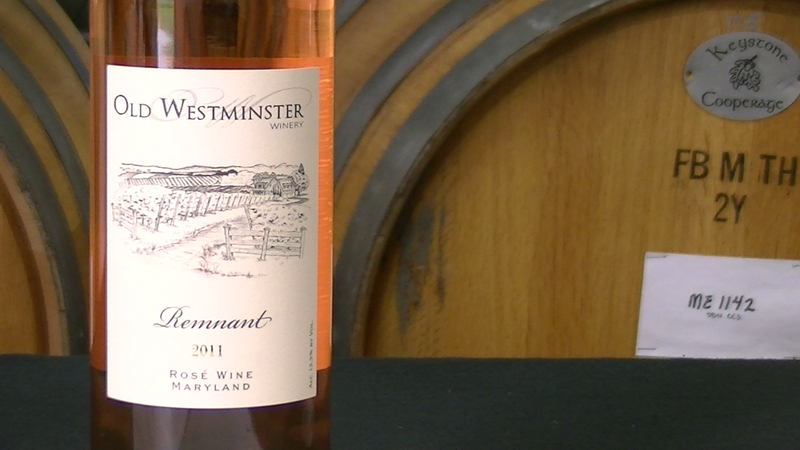 The winery produces a semi-sweet style Rosé of Isabella wine named after a popular wine that used to be produced by the Great Western Winery (now the Pleasant Valley Wine Company). Every vintage of this wine has won at least one gold medal and the 2004 vintage won Gold and was named “Best Native American Varietal” at the 2005 NY Wine Classic. Isabella is also produced at a few other American wineries that specialize in producing wine from labrusca grapes. Also in New York, Barrington Cellars produces a semi-sweet rosé wine and an Ice wine from Isabella. And a little southwest in North East Pennsylvania, Heritage Wine Cellars produces several labrusca wines which include Isabella.